Summer is quickly coming to an end in the Pacific Northwest. We’ve had an amazingly warm and sunny summer, but this week fall has started to creep in. It started with wind and rain storms last weekend and has toned it down to just rain. Luckily, it looks like we’re going to get a reprieve this weekend with a sunny forecast. The rain is kind of a bummer, but Washington state needs it with our wildfires in the eastern part of the state. It’s also a good reminder that school starts on Monday for my daughter. It’s way easier to say good-bye to summer with rain than sun. But I should get to what this post is actually about! 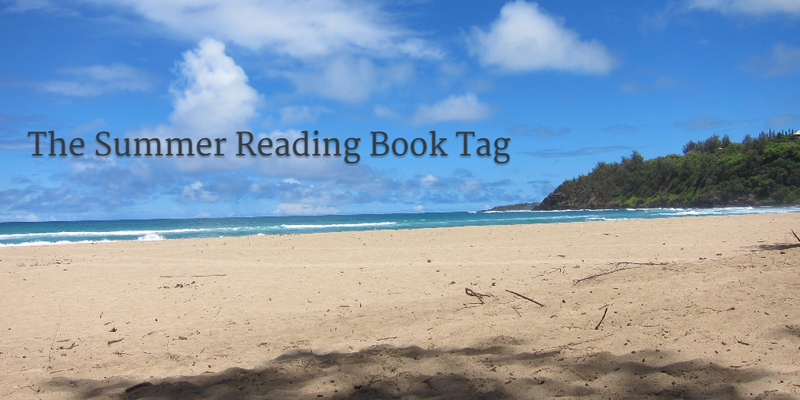 I was tagged by Giselle @ Hardwork Boulevard and Joey @ Thoughts and Afterthoughts to complete The Summer Reading Book Tag. I couldn’t think of a better way to say goodbye to summer on A Novel Glimpse. Series lovers are probably going to want to shoot me for this one, but I had a hard time getting into Grey (review here). Christian was so bitter and mean at the beginning. Since it was basically the exact same story as Fifty Shades of Grey, it was like a really bad version of a story I originally liked. It got better as it went a long. I credit that to Christian meeting Ana. Sincerely, Carter was a lot of fun to read. I loved watching two best friends fall in love after years of knowing each other. For some reason, this type of romance is one of my favorites. You can read my review here. The Ghost Bride takes place in 1893 Malaya. It’s an interesting tale about a daughter trying to avoid becoming a ghost bride. I can’t not pick Grizz from Nine Minutes for my shady character. Grizz is the one of the shadiest characters I’ve ever read. If you haven’t read this book, you should. The description is a little off-putting and the cover kind of plain, but if you read my review, you should get a picture of what an amazing tale this is. Hmmm….I don’t know that I can answer this one. If anything, I would say some of the books I read have overly developed plots. I can’t think of one that was barely developed. Guess I’m passing on this one. I told myself that I was going to get through the tag without choosing Bright Side as an answer to one of these questions, but I can’t do it. Not when it’s about characters full of life. Kate was the opitome of full of life. She made me smile and laugh so many times. In Gone Girl style, Dear Daughter leaves you guessing until the end. That’s why I chose it for one of my Before the Blog posts. The Ghosts of Heaven crosses four very different settings, at very different times. There are connections to be made between them. I won’t say more because I wouldn’t want to ruin the ending for anyone. All I am going to say is read this book from the beginning to the end. You may think you’re getting bored at times, but keep going. I actually yelled profanity at the end and my husband thought I was nuts. Honestly, I could have picked just about any romance for this one. I went with Him because you get not one but two hunks. Both Jamie and Wes sound incredibly hunky. It was so much fun to do! You’ll love it! Thanks for the tag. I’ll do it as soon as I can! You’re welcome! I hadn’t read any of his stuff before that either. Hope you enjoy it!